"Gracious, This is Gracious - OBI Box Set - 3 CDs"
GRACIOUS - THIS IS GRACIOUS - Japanese OBI MINI REPLICA LP TITLES making a 3 CD Box Set- Japanese OBI MINI REPLICA BOX SET Japanese re-mastered Mini LP replica Limited Edition Collection Recorded from the finest Original Masters available. Each title Comes with anti-static sleeves similar to Vinyl LPs, Cardboard packaging exact to the original LP, Re-sealable plastic wrap cases for protection of each collectible and include extensive Liner Notes Booklet. Actual miniaturized version of the 12" LP in 4" CD version Special VERY RARE LIMITED EDITION BOX SET ONLY PRODUCED ON FUTURES FOR THIS ONE TIME PRESSING -- were only available in Japan. 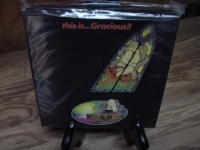 THE GRACIOUS BOX SET - THIS IS .. GRACIOUS INCLUDES THESE TITLES - GRACIOUS THIS IS ... GRACIOUS - Limited edition Japanese pressing of this album comes housed in a miniature LP sleeve. Phillips Track Listings 1. Super Nova: Arrival of the Traveller, Blood Red Sun, What's Come ... 2. C.B.S. 3. Once on a Windy Day 4. Blue Skies and Alibis 5. Hold Me Down THE HUMAN BEAST VOLUME ONE - Limited edition Japanese pressing of this album comes housed in a miniature LP sleeve. Decca Track Listings 1. Mystic Man 2. Appearance Is Everything Style Is A Way Of Living 3. Brush With The Midnight Butterfly 4. Maybe Someday 5. Reality Presented As An Alternative 6. Naked Breakfast 7. Circle Of The Night ZAKARRIAS - Japanese Limited Edition Issue of the Album Classic in a Deluxe, Miniaturized LP Sleeve Replica of the Original Vinyl Album Artwork Track Listings 1. Country Out Of Reach 2. Who Gave You Love 3. Never Reachin' 4. Unknown Years 5. Sunny Side 6. Spring Of Fate 7. Let Us Change 8. Don't Cry 9. Cosmic Bride These are Japanese digitally re-mastered Mini LP replica CDs (the OBI Edition). This Limited Edition Collection has only VERY FEW made world-wide and are immediately Out of Print. Recorded from the finest Original Masters available. Comes with anti-static sleeves similar to Vinyl LPs, Cardboard packaging like an LP, includes extensive Liner Notes Booklet. Actual miniaturized version of the 12inch LP in 4inch CD version.